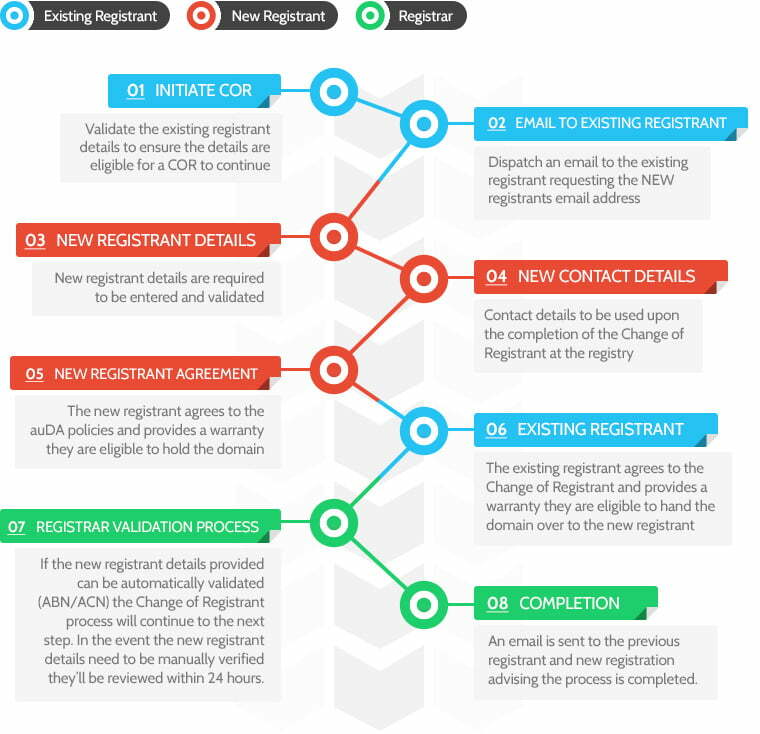 What are the steps involved in completing an AU domain Change of Registrant (COR)? A Change of Registrant (COR) is required in order to change the legal owner of an AU domain name, that is, the ABN/ACN/RBN/other eligibility type listed on the domain WHOIS. Login to your MyZuver account. Click Manage Domain Names button on your MyZuver dashboard. Click on the relevant domain name. In the drop-down options select Initiate COR. This will generate a $12 invoice in your account and once paid, we’ll automatically initiate the COR from our end. Please keep in mind that the Change of Registrant process WILL reset your domain expiry period. This means that even if you have 321 days on your domain left, you will forfeit the remaining period on your domain and the 1 year will commence from the CoR completion date. The process from here is quite simple whereby we’ll send the existing domain name owner an email which will contain a link to a form. Once that form is completed the gaining registrant will receive an email to enter their details. Following this we’ll verify the new details are correct and then push it through for completion. If you simply wish to update your domain name contacts, you do not need to complete a Change of Registrant.